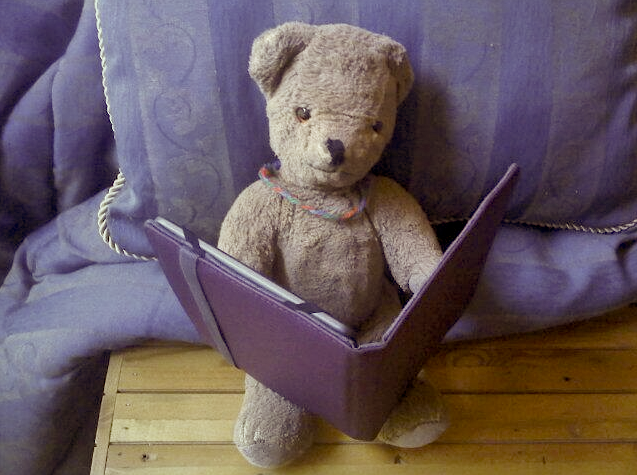 Meet my teddy bear, Nicki (an avid reader). I’ve had him since I was born in Coventry, at which time he was bought in Hamley’s. And that’s a long time ago, as I’m turned thirty now (the Internet says so, so it must be true). I love him in a way I love no other inanimate object. A teddy bear can be so much more than a possession. A childhood companion, friend – even family. Nicki’s come with me round the world, when many of my friends and family could not fit in my suitcase, so, in a way, I’ve spent more time with him than anyone. I’ve lost many things – but I’d be heartbroken to lose him, and I’m fully grown now (perhaps even shrinking, which, at five foot nothing, doesn’t seem fair). Losing him as a child would have been Armageddon. Compassion can wear many coats, but it often involves placing yourself in someone else’s shoes, and doing what one can to make those shoes more comfortable for their original occupant. I know many people who don’t adore social media – it’s not their cup of tea. For others, it’s an all-you-can-eat buffet. I’m one of the latter – ever sold on Facebook since someone found my wallet in the street and then found me on FB so they could send it back to me, from Edinburgh to London, declining my reimbursement of postage. A post popped up yesterday comparing Facebook to a fridge – you know nothing’s changed, but you go and open it every ten minutes anyway. Working on my own, online, it’s often a welcome break that can clear my mind for a few seconds before getting back to it. And sometimes, magical treats have appeared in the fridge while I wasn’t looking. A case study in point. 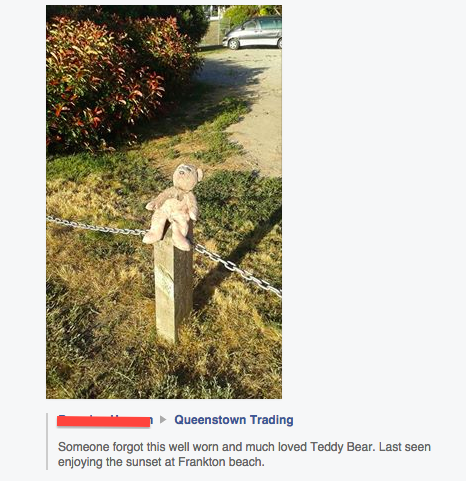 A child lost their teddy bear, Ratty, and the story popped up in my newsfeed because of a local trading group I belong to in sunny Queenstown. 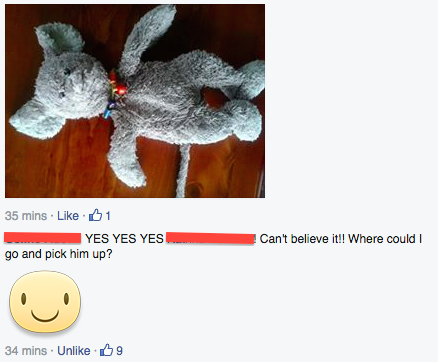 It made me happy (not the child losing their teddy bear – I’m not a monster – but the story’s ending. Hmm, spoiler). This adorable photo is reposted with permission. People sympathised. And someone who’d seen a stray bear piped up. Unfortunately, he wasn’t the one. But then another did the same. And it was. Compassion can be big or small. It still counts. It can be a case of being big now, but remembering how much bigger small things were, when you yourself were smaller. It can be not walking past something that is lost, ignoring it because it is meaningless to you, but instead picking it up, because you know that it is meaningful to someone else. Another treat in the fridge today? A case study from Lizzi, to whom compassion is first and second nature. It was sparked by seeing someone putting themselves in someone else’s running shoes. Look around you. Is there someone doing the same? Could you help? Is there a teddy bear lying in the corner, lost and alone? Maybe pick it up. To read some background, return to Lizzi, whose inspiring post beats like a heart in our village-centre, and check in with Yvonne, who called forth a body of builders to grow around it – now over a thousand strong. 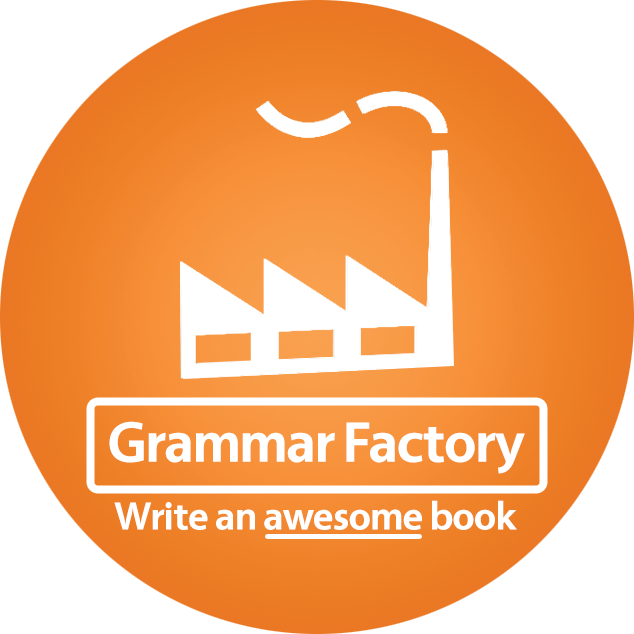 This entry was posted in On Making The Right Mark and tagged #1000Speak, 1000 voices for compassion, author, compassion, editor, lost and found, make the right mark, put yourself in someone else's shoes, right ink on the wall, sara litchfield, teddy bear, writer on January 27, 2015 by Sara Litchfield. BUT…these things matter, and the heart wants what it wants. If I lost it now, there’d still be Apocalypse. I’m glad you have Nicki. I’m glad you’re part of 1000Speak. I’m glad we ALL are 😀 It’s an amazing thing, which I feel happened at *just* the right moment for so many people to take up the cry. Ah sappy in a good way 🙂 may you never lose your blankie – in fact, may none of us ever lose the things we hold close that remind us of being young and innocent… Things that never make demands on us, that we love freely and openly… I’m delighted to be part of 1000Speak. I think it’s done the same for a lot of people – made us more observant of examples of kindness all around. I think so, and I hope so, and long may that continue, along with the desire to combat the negative crap in the world by being, and sharing, the positive difference. Sara, I didn’t have a teddy, but I did have a blankie named Puffy. Once, while traveling from Portland to Chicago, he was left on the plane. My mother, a flight attendant at the time, flew back to get him and bring him home. Day saved. It is amazing the tender reach compassion has into the heart. And you’re right…there are both large and small ways to breathe into others in loving ways. 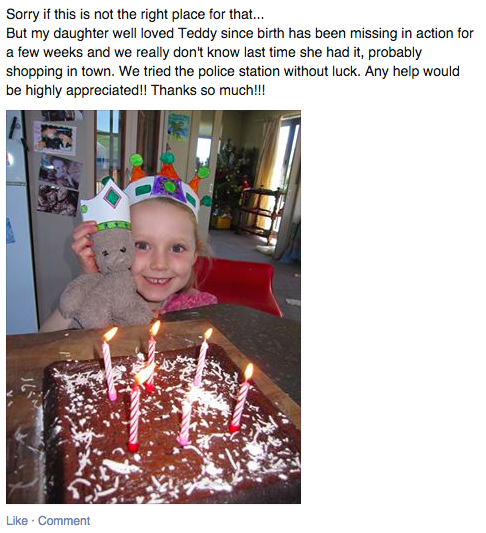 I’m so happy that little girl was reunited with her Teddy. And am equally thrilled you still have a loving hold on Nicki after all these years. Ah that was wonderful of your mother, I’m so glad 🙂 I’d go some distance to get Nicki back if he was lost. The idea that, busy as we all are, there are people who take the time to pick up teddy bears and find their owners just delights and comforts me – it gives me hope. It really is the little things that move us. Without the little, sometimes we miss the big. This is such a lovely, heart-warming post and really made me smile. I once had a beloved Forever Friends bear returned to me when I left her behind on holiday. I was devastated, but my dad got on the phone and she was back, wrapped in brown paper, just a couple of days later. My relief was immense. And I still have her. I like the Facebook/fridge analogy a lot too! Ah yay, thanks Steph! I’m so glad you got your bear back too 😀 I haven’t seen a Forever Friends bear in a long time! 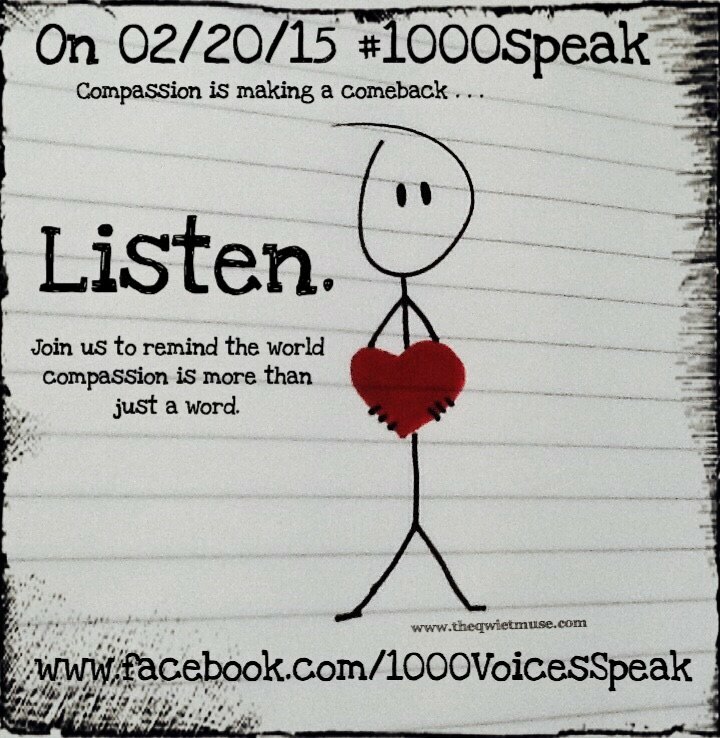 I really like the 1000 Voices for Compassion blogging idea, btw. I think I’d like to contribute, but… I don’t what I’d write about yet in advance of that day. Are they talking about possible ideas on the Facebook group? Yes! So glad you’ve joined the group 🙂 There’s definitely a thread about that somewhere & I think someone posted on it – let me do some digging and I’ll shout when I find it!